ORLANDO, Fla. — State titles have become a rite of passage for the Plantation American Heritage Patriots. 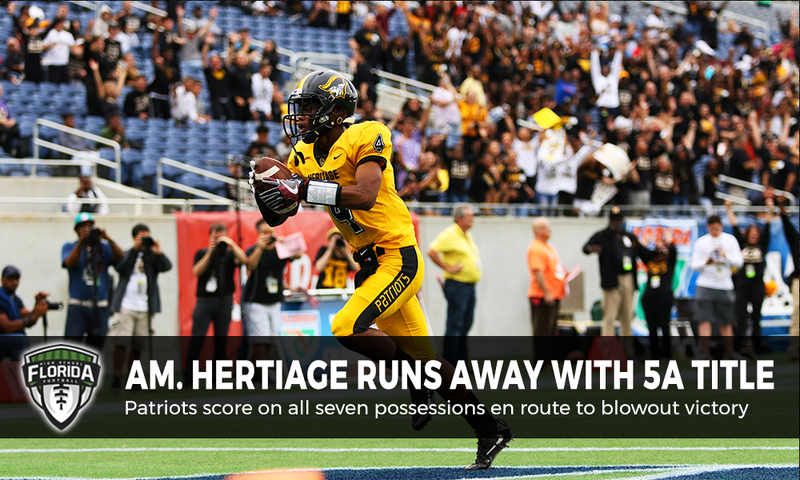 The latest Class 5A state title, the fourth in five years for American Heritage, involved a bumpy and difficult road to Orlando. The championship game itself was a breeze, as American Heritage (13-0) rolled to a 37-0 halftime lead and breezed with a running clock in the second half to a 44-15 win over first-time state finalist Baker County. American Heritage went right down the field on a methodical 13 play, 77-yard drive that was capped off by a 1 yard TD run by quarterback Cam Smith. After a Baker County punt, American Heritage put together another 11 play drive covering 69 yards that led to a 33-yard field goal by Jared Elstein and the Patriots led 10-0. That was the score at the end of the opening quarter. In the second quarter, the bottom dropped out for Baker County (13-2). First American Heritage expanded their lead to 17-0 on a 39-yard pass from Smith to Joshua Alexander. Then after Baker County finally got a drive going offensively, Seth Paige fumbled and defensive lineman Nester Silvera rumbled 57 yards to the end zone and the Patriots lead swelled to 24-0. American Heritage wasn’t nearly finished though, as they would score on two more 1-play drives before the first half was over. Smith completed a 43 yard TD pass down the left sideline to Anthony Schwartz to make it a 30-0 Heritage lead with 3:13 left before halftime. Then after another Baker County punt, the Patriots struck one more time as the speedster Schwartz scored from 37 yards on a jet sweep around right end and the running clock was in effect as American Heritage led 37-0 at the halftime break. Baker County did show some heart coming out after the halftime break as Nick Lee broke off a 48 yard run to set up a 3 yard TD run by Seth Paige to get the Wildcats on the board to make it 37-7. Then after Baker County recovered an onside kick, the Wildcats struck right back. Baker County quarterback John Green completed a short pass to Paige, who threw a 48-yard halfback pass to Lee Graham and Baker County had some life as they trailed 37-15. But American Heritage recovered another onside kick, and with the running clock was able to bleed out most of the second half. The Patriots put one more score on the board with as Smith scored again from 1 yard out to make the final 44-15. For American Heritage, Smith was 7 of 11 passing for 144 yards and 2 TD’s passing and ran for 65 more yards and 2 TD’s on the ground. Schwartz had two catches for 53 yards and a TD receiving and had the 37-yard touchdown run. Paige rushed for 49 yards on 13 carries and a TD on the ground to go along with the 48 yard TD pass. Baker County only attempted seven passes in the loss, their first state championship since their opening game at St. Augustine. For American Heritage coach Patrick Surtain, he is now 27-0 in 2 seasons as Patriots head coach with two state titles.